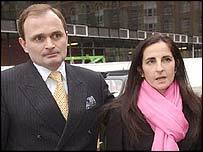 Major Charles Ingram has been found guilty of cheating his way to the top prize on Who Wants To Be a Millionaire. During his trial for conspiracy to cheat the programme out of its £1m jackpot prize, a jury at Southwark Crown Court watched an unedited video recording of him making his way to the top that was never shown on TV. Ingram was found guilty along with his wife Diana and college lecturer Tecwen Whittock of tricking game show host Chris Tarrant into signing the £1m cheque. Ingram was first shown winning the "fastest finger" round by putting in correct order the words from the Agatha Christie novel "Death", "On", "The", "Nile", in 3.97 seconds. After reaching the hot seat to face host Chris Tarrant, Ingram told Tarrant: "To be honest, I will be happy to walk away with anything. "If I can go away to work and hold my head up high, I will be happy. "I will probably crash and burn, so we will see. The only thing I have done is read quite a lot of children's books." He said his children had asked for a pony if he won. "All of them are willing to share one and they have been saying they are happy to give up their next three birthdays and Christmases." Tarrant referred to Ingram's wife in the studio audience and her previous £32,000 win on the show. Ingram joked: "We have both got big families so there are plenty of people to come." Here are the details of Ingram's winning round: He easily passed through the first questions, guessing that the word "horse" followed the word "clothes" and that butterscotch was a type of toffee. But on question six, for £2,000, he had to use the "ask the audience" lifeline when faced with the question: "In Coronation Street, who is Audrey's daughter?" The audience gave an 89% vote for Gail. He selected the answer and progressed to the next question. Next he struggled on the question: "The River Foyle is found in which part of the UK?" He phoned a friend, Gerald in south Wales, who gave him the correct answer of Northern Ireland. The recording for the day then came to an end, with Ingram looking to the ceiling and saying: "God, no." The next night he returned, he told Tarrant he would be more assertive. Ingram: "I have a strategy. I was a bit defensive on the last show and I started to talk myself out of answers that I should know. "This time I'm going on a counter-attack. I'm going to be a bit more positive. "I'm going to show a bit more self-commitment." He struggled on the first question that night, question eight for £8,000. Asked who was the second husband of Jacqueline Kennedy, he pondered the four possibilities: Adnan Khashoggi, Ronald Reagan, Aristotle Onassis, or Rupert Murdoch. On two occasions, when he said the name Aristotle Onassis out loud, a cough was heard on the tape played in court, coming from one of the contestants waiting for their turn at the "fastest finger" round. Ingram selected Aristotle Onassis, which was the correct answer, taking him up to £8,000. No coughing could be heard when Ingram faced question 9: "Emmental is a cheese from which country? - France, Italy, Netherlands or Switzerland." "I would like to say Switzerland but I am not sure. "When you're up here, your doubts multiply tenfold." He said he remembered seeing it on packaging before. Tarrant told him it was the right answer, adding: "I do not know what your strategy or counter-strategy is but you have just got £16,000. You're doing well." On the £32,000 question of "Who made the album Born To Do It in 2000? ", Ingram selected his "50-50" lifeline, leaving him the options of Craig David or A1. He said he thought it was A1, drawing gasps from the audience. Mr Hilliard, prosecuting, suggested it was this which made Ingram change his mind and choose Craig David - the correct answer. Again there was no coughing. Question 11 was: "Gentlemen versus players was an annual match between amateurs and professionals of which sport - lawn tennis, rugby union, polo or cricket." Major Ingram: "I think it is cricket." "I think I have seen it printed on an old cigarette carton or on my grandfather's study wall. "Maybe it was polo... It is less likely to be rugby union. "I think I would take cricket." Told he has won £64,000, he jumped up and shouts "yes" before returning to his seat, saying "no more risks". For £125,000, Tarrant said: "The Ambassadors in the National Gallery is a painting by which artist? - Van Eyck, Holbein, Michaelangelo, Rembrandt." Ingram: "I think I'm going to go for Holbein." Again he jumped to his feet being told he had won. Ingram said by this stage he was able to consider buying his own house with the money he stood to win, but the next question promised £250,000. Tarrant: "What kind of garment is an Anthony Eden? - An overcoat, hat, shoe, tie." Ingram: "I think it is a hat." Ingram: "Again I'm not sure. I think it is..."
Ingram: "I am sure it is a hat. Am I sure?" Ingram: "Yes, hat, it's a hat." And, to cheers, Tarrant told him it was the right answer. For the £500,000 question, he was asked: "Baron Haussmann is best known for his planning of which city? Ingram: "I think it is Berlin. "I think Haussmann is a more German name than Italian or Parisian or Athens. "I am really not sure. I'm never sure. If I was at home, I would be saying Berlin if I was watching this on TV." A cough was then heard, which the prosecution claim sounded like someone saying the word "no". Ingram: "I do not think it's Paris." Ingram: "I do not think it's Athens, I am sure it is not Rome. "I would have thought it's Berlin but there's a chance it is Paris but I am not sure. "I think it is Paris." Ingram: "Yes, I am going to play." Tarrant: "Hang on, where are we?" Ingram: "I am just talking to myself. It is either Berlin or Paris. I think it is Paris." Ingram: "I am going to play Paris." Tarrant: "You were convinced it was Berlin." Ingram: "I know. I think it's Paris." Tarrant: "He thought it was Berlin, Berlin, Berlin. "You changed your answer to Paris. "What a man! What a man. Quite an amazing man." The final question was: "A number one followed by 100 zeros is known by what name?" A googol, a megatron, a gigabit or a nanomol. Ingram: "I am not sure." Tarrant: "Charles, you've not been sure since question number two." Ingram: "The doubt is multiplied. "I think it is nanomol but it could be a gigabit, but I am not sure. "I do not think I can do this one. "I do not think it is a megatron. I do not think I have heard of a googol." "By a process of elimination I have to think it's a googol but I do not know what a googol is. "I do not think it's a gigabit, nanomol, and I do not think it's a megatron. "I really do think it's a googol. Tarrant: "But you think it's a nanomol, you have never heard of a googol." Ingram: "It has to be a googol." Tarrant: "It's also the only chance you will have to lose £468,000. "You are going for the one you have never heard of." Ingram: "I do not mind taking the odd risk now and again. "My strategy has been direct so far - take it by the bit and go for it. "I've been very positive, I think. "I do not think it's a gigabit, I do not think it's a nanomol or megatron. I am sure it's a googol." He then teased the audience, saying: "I'm going to play. No, I'm not. Yes, I am." Tarrant: "You lose £468,000 if you are wrong." Ingram: "No, it's a googol. "God, is it a googol? Yes, it's a googol. "Yes, yes, it's a googol." Ingram: "I am going to play googol." "He initially went for nanomol, he then went through the various options again. "He then went for googol because he had never heard of it and he had heard of the other three. After the audience cheers died down and Ingram's wife had joined him on the set, Tarrant said: "I have no idea how you got there, you went to hell and back out there. "You are an amazing human being." Ingram's wife added: "How the hell did you do it?"